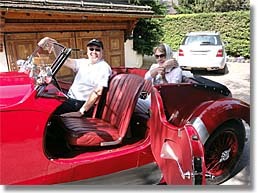 When we had first arrived in Gstaad, on Friday, June 21, we’d been struck by the number of Rolls-Royce, Bentley, and Aston-Martin touring cars and coupes from the Thirties, Forties, and Fifties cruising through the village and its surrounding mountain roads. 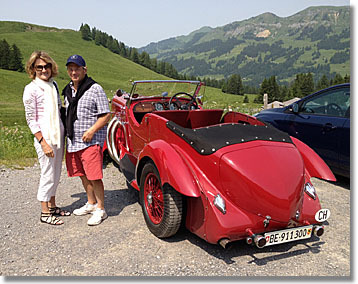 It turned out there was a Classic Car convention in Gstaad that weekend, and I’d spent the next few days gaping at the pageant and wondering what it would be like to take a ride. Then our chalet host Tom showed us what he had stashed in his garage: a 1937 Lagonda coupe. Why don’t we spend your last Saturday, driving the Lagonda up the mountains to a little restaurant in a 1,000-year-old community with no electricity? he’d suggested. Sounded good. Really, really, really good. So as we gathered Saturday morning for the final morning session, Lesley’s and my minds were elsewhere. We didn’t bother to dress for tennis, as Tom was picking us up at the Palace at about 10:30. But we wanted to say our goodbyes, share e-mail addresses, and take a few last pictures. “It pleases me to see so many goodbyes,” Joy Emerson told me, among the hugs and cheek-to-cheek air kisses (if you’re scoring at home, the Swiss do three, the French only two). “Believe me, that doesn’t always happen. But you can tell a lot of real friendships were formed here this week.” Up until about three years ago, Joy would have likely been on the courts with us, at least some of the time. Persistent aches and pains had ended her playing, but not her enthusiasm for the game. And she loved seeing us loving it. The 1937 Lagonda LG45 Rapide appeared on the cover of the Aston-Martin News magazine in June 2007. Antique Car Magazine noted that a 1937 Lagonda LG45 Rapide sold six years ago, at an auction in Monterey, California, for $671,000. Tom said there are only 25 in the world today. Was he going to let me take the wheel? If Tom is one thing, it is that he is not—as Emmo might put it—a stupid idiot. Not that I think I could’ve driven it, no matter how idiotic its owner might be. For one, the gas pedal sits between the brake and the clutch. For another, the steering wheel requires powerful arms and shoulders, and superb technique and understanding. Even so, some very tight corners require multiple back-and-forward maneuvers to get the vehicle around. And, according to Tom, the brakes aren’t that good. That said, I assumed that we would take a short spin, and pay no attention to the fact that the speedometer suggested that—in its day—the Lagonda could hit 180 kph (over 100 mph), which was probably faster than some planes could fly back then. So when Tom, on what seemed to be a fairly short straightaway between two Les Diablerets mountain passes—the Col de Pillon at 1,550 meters above sea level and the Col de la Croix, at 1,780 meters—decided to pass a pokey VW station wagon on a Swiss “super-highway” (two lanes, but very curvy, with guardrails about six inches high), I noticed that Lesley, sitting in the backseat, had her eyes closed. We reached 100 kph, our exhaust pipes trumpeting like the angel Gabriel. Did I mention that a 1937 Lagonda has no seat belts? Or that our round-trip registered as about 100 kilometers? When we approached Taveyanne, our restaurant destination, Tom slowed as we passed a small herd of cows (on a traditional “highway”—one lane, and no way we were pulling off the road for someone). “Moo,” he shouted, as they munched on the roadside grass. Remarkably, their bells around their necks jangled in reply. “We are having a conversation,” he said happily. In any Top Ten List of the Reasons Why One May Have Spent Too Much Time In Switzerland, Number One is likely, “You say ‘Moo’ to cows, and announce you are having conversations.” And, Tom, I mean that in a collegial and team-building way. Taveyanne, thankfully, had a wonderful dry Swiss white, miraculously kept cold. And while there were no power lines, most of the small huts and chalets had solar panels on the roofs. 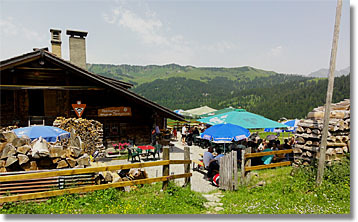 Fed and watered, we made or way back to Gstaad, rested and packed, and capped our final evening at the Saanenhof restaurant, a bit above the valley. We ate the best Swiss meal of the trip, drank French wine in anticipation of our next stop, Paris, and eavesdropped as Tom and the chef/proprietor had a conversation. Neither of them, thankfully, used the word, Moo.